This article offers a look at how fluorescence and tandem dyes operate. Electromagnetic energy from a laser set at the correct wavelength provides the correct amount of energy to an electron in the fluorescent dye molecule. This is the signature excitation wavelength for the molecule. This electron absorbs the energy. 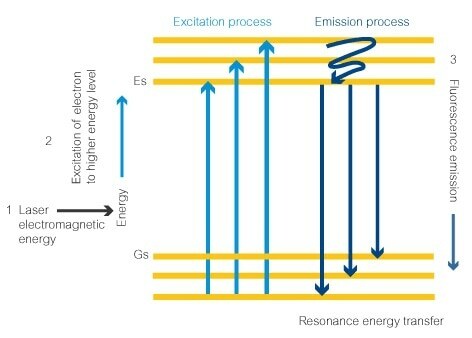 After the absorption of this energy, the electron moves to an excitation state at the next energy level (Es). Finally, the energy is released in the form of a photon (fluorescence) and the electron moves back down to the lower energy level. The amount of energy released is determined by how far the electron drops down the energy levels, which will always be the same in the same fluorescent molecule. This determines the wavelength of the photon, and the color of the fluorescence observed, giving the fluorescent dye its signature emission wavelength. ​How do Tandem Dyes Work? Tandem fluorescent dyes are conjugated 'dual' fluorescent molecules. One example is PE-Cy5. On the antibody, they will be close enough so that the energy can be transferred between the two. The laser excitation wavelength used will excite the donor molecule (e.g., PE), although it will not be the correct wavelength to excite the acceptor molecule. The energy released from the donor molecule will be at the correct wavelength to excite the electron in the acceptor molecule. The acceptor molecule will then release energy in the form of a photon at its own signature wavelength. For example, PE-Cy5 will emit at the emission wavelength for Cy5 (670 nm) and excite at the excitation wavelength for PE (565 nm). 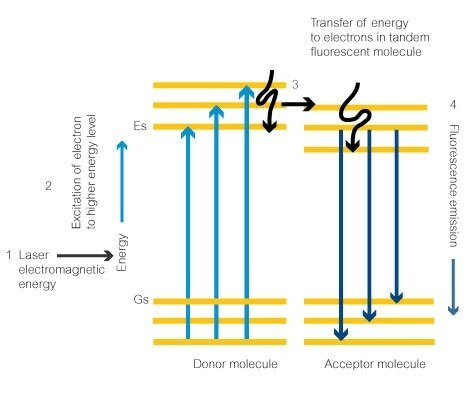 Electromagnetic energy from a laser set at the right wavelength will give the ideal amount of energy to an electron in the donor fluorescent dye molecule. This is the signature excitation wavelength for the molecule. This electron absorbs the energy. The electron absorbs the energy and goes to an excited state at the next energy level, Es. The electron releases the absorbed energy as a photon. This causes the electron to return to the lower energy state. The energy is released in the form of a photon. This then excites an electron in the tandem dye molecule which moves up to the next energy level. Finally, the energy is released from the electron in the form of a photon (fluorescence) and it drops back to the lower energy level. The amount of energy released is dependent on how many energy levels the electron drops through. This will always be the same in the same fluorescent molecule. The energy emitted will therefore decide the photon’s wavelength and the color of the emitted fluorescence. Whether you require one or more fluorochromes, Abcam has compiled a new fluorochrome chart to make the process straightforward. It contains aligned emission and excitation spectra for 30 of the most commonly-used fluorochromes, with information about popular instrument lasers and filters shown across the chart for easy visualization. Abcam has included a step-by-step guide to aid you through the process.